Our farm gates are always open to new Co-workers and we can offer a range of specifically tailored support packages to suit all levels of need. We think mud (especially the organic type) is marvelous but we know that isn’t the case for everyone. To ensure that Prospects Trust is the right place we offer a free taster day on the farm for any potential new Co-worker. 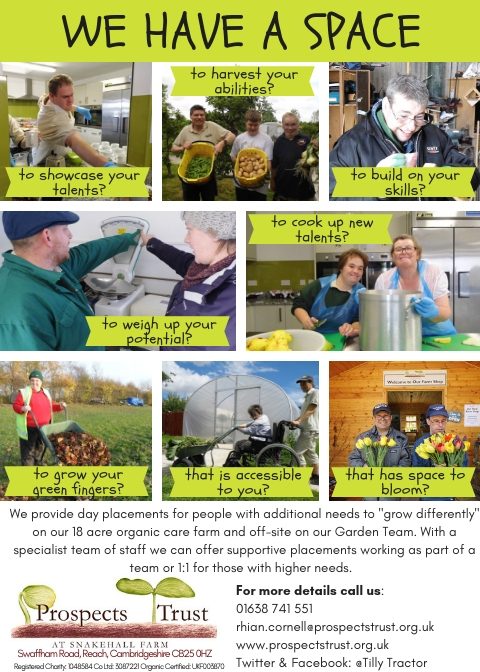 To find out more about Day Placements or Day Placements with Personal Support, download How to Set Up a Placement or if you require further information ring Rhian in the office on 01638 741551. Please bring our Initial Details Form with you on your first visit to us. We also work with schools and colleges to provide supported work experience and can tailor sessions to incorporate your learning outcomes with our experienced trained staff. Please ring Rhian in the office to discuss further.